Composed in 1880, the Serenade was given a private performance at the Moscow Conservatory on 3 December 1880. Its first public performance was in St Petersburg on 30 October 1881 under Eduard Napravnik (24 August 1839 – 10 November 1916), the Czech conductor and composer, who settled in Russia and is best known for his leading role in Russian musical life as the principal conductor of the Imperial Mariinsky Theatre in Saint Petersburg for many decades. Valse: Moderato — Tempo di valse The second movement has become a popular piece in its own right. At its premiere, the movement had to be repeated. Anton Rubinstein (November 28 [O.S. November 16] 1829 – November 20 [O.S. November 8] 1894), the Russian pianist, composer and conductor, and Tchaikovsky’s former teacher declared that the second movement is Tchaikovsky’s best piece. Considering the dance origins of the minuet and trio, and its usurpation by the abstract instrumental genres of the 18th century, it seems sensible that Tchaikovsky would integrate the most amorous of 19th-century dances into his symphonies and the String Serenade. Élégie: Larghetto elegiaco The third movement opens with another chorale-like passage, here, one that incessantly aspires to rise above its mezza-voce tessitura. The tender melodic writing of the first theme is brought to fruition upon its return, elaborated with another, more florid melodic layer; the transparent soaring counterpoint floats above the lightest of accompaniments, arpeggiated pizzicato figures in the low strings. The darker, more desperate voice found in the composer’s last three symphonies dominates much of the mood of this movement. Finale (Tema russo): Andante – Allegro con spirito The Finale opens with an introduction in the dominant key (G), bringing us back one step closer to earth, smoothly linking the D-major Elegia and the C-major Finale. The Andante introduction is based on a Russian folk tune, a Volga “hauling song.” Both the main theme of the Allegro con spirito, based on the shape of the Serenade’s opening chorale, and that chorale itself, which is the movement’s penultimate gesture, provide an arching sense of unity which spans the entire work. The Concertgebouw Chamber Orchestra was founded in 1987. Its members come from the ranks of the world famous Royal Concertgebouw Orchestra. Prior to 1987, the Orchestra was known as the Amsterdam Chamber Orchestra. During this period, from 1957 to 1987, the Amsterdam Chamber Orchestra made numerous recordings with conductors, such as Andre Rieu sr., Anton van de Horst, and Marinus Voorberg. 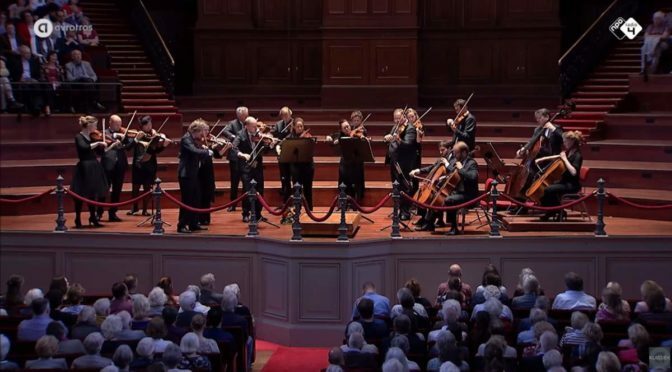 The Concertgebouw Chamber Orchestra has performed at several important occasions, including the 1980 inauguration of Queen Beatrix, Queen of the Netherlands and during the State visit of the American President, George Bush Sr. to the Netherlands in 1989. The orchestra was also invited to perform during the ceremony of the royal wedding of the Dutch Crown Prince, William Alexander to Princess Máxima, on February 2, 2002, in the Nieuwe Kerk in Amsterdam. As a result of this performance, the CD, “Music from the Royal Wedding” was made. It sold more than 75,000 copies and received the unique “triple platinum” award. Due to the great international interest in the Concertgebouw Chamber Orchestra, the group has been invited to perform on several international podiums. Tours have included, Belgium, Italy, Spain, Germany, Finland, Portugal, Japan, and India. The orchestra has made numerous CD’s, with the Schubert/Mahler and Beethoven/Mahler string quartets (conducted by Marco Boni) receiving the highest rating of five stars from the BBC Music Magazine, for both performance and sound technique. The newest releases, including works by Mozart, Haydn, Schubert, Mendelssohn and Tchaikovsky, were recorded using the latest technology, the “Super-Audio-CD”, five channel system by PentaTone. The Concertgebouw Chamber Orchestra has performed with world renowned soloists, including Maria Joao Pires, Friedrich Gulda, Elane Rodrigues, Lynn Harrell, Jaap van Zweden, Marietta Petkova, Vesko Eschkenazy, Ronald Brautigum, Emily Beynon, Janine Jansen, Mischa Maisky, and Shlomo Mintz.